A new research study has concluded that Pluto should be reclassified as a planet. According to the study, the reason Pluto lost its planet status is not valid. Philip Metzger, a planetary scientist at the University of Central Florida, makes his argument in a paper published in the journal Icarus. 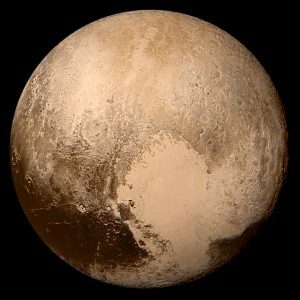 The International Astronomical Union (IAU) downgraded Pluto’s status to “dwarf planet” in 2006 based on updated rules for what is and what isn’t a planet. According to part of the IAU definition, a planet must be the largest gravitational force in its orbit. Because Pluto’s orbit is affected by Neptune’s gravity and it shares its orbit with objects in the Kuiper belt, it does not qualify. Yanking Pluto’s status as a planet has always been a controversial decision. It became a more prominent issue after NASA’s New Horizons spacecraft flew past it in 2015. Pluto is now believed to be nearly as complex as Earth. The dwarf planet has a multilayer atmosphere, an underground ocean, evidence of ancient lakes, organic compounds, and multiple moons. Metzger, lead author of the new study, says that orbit requirement in the IAU definition is based on “since-disproven reasoning” in a study from 1802. Because of that, he believes that the IAU definition of what constitutes a planet needs revision. The study was co-authored by Mark Sykes of the Planetary Science Institute; Alan Stern, of the Southwest Research Institute; and Kirby Runyon of Johns Hopkins University Applied Physics Laboratory. Metzger says that the definition of a planet should be based on its intrinsic properties rather than properties that can change. He is recommending a planet classification system based on whether the object is large enough for its gravity to create a celestial body spherical in shape. In the 1950s, astronomer Gerard Kuiper said what really determines what is and what isn’t a planet is how the celestial body is formed. The IAU says that it has not yet received a formal proposal to change its definition of a planet.